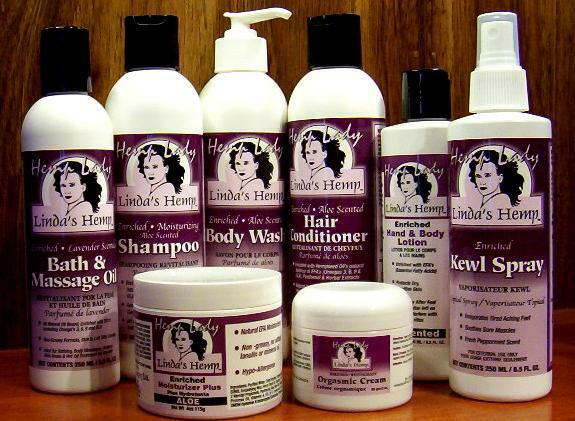 We are proud to offer our customers quality hemp enriched Beauty Care Products. Our products are made in a Health Canada licensed facility from pharmaceutical grade raw materials. All Hemp Lady products are environmentally friendly formulations and animals were not used in the testing of these products. All products have been enriched with oil from our own naturally grown hemp seed. No other oil from the plant kingdom is as rich in essential fatty acids as hemp seed oil. These EFA's include Omega-3, Omega-6, Omega-9, Gamma Linolenic Acid (GLA) and Stearidonic acid. In cosmetic testing, these EFA's have been proven to play a preventative roll in the skin's aging process. Because of the properties of Hemp Seed Oil, eczema suffers get a lot of relief from our Beauty Care Products. Thank you for visiting our website. We will be waiting to hear from you. Contact the HempLady for your nearest retailer.